Aggron in game: 1,436 Who? Important notice! Pokemon Aggron is a fictional character of humans. 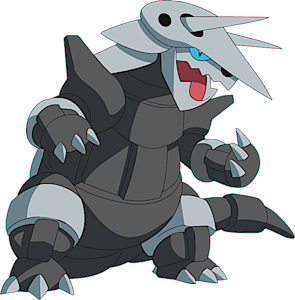 Aggron (Japanese: ボスゴドラ Bossgodora) is a dual-type Steel/Rock Pokémon introduced in Generation III. It evolves from Lairon starting at level 42. It is the final form of Aron. It can Mega Evolve into Mega Aggron using the Aggronite. Aggron is a huge, bipedal Pokémon. It is primarily black with plates of silver-colored armor. The armor on its head has two pairs of holes with horns protruding from the foremost holes. Its forehead plating extends past its upper jaw in a small point. It has sky-blue eyes, and two nostril-like holes on the tip of its upper jaw. On the rim of its mouth are several pointed, fang-like protrusions and the nape of its neck and back have gray-silver armor sections. It has wide, blunt spikes on its shoulders, and gray-silver bands on its arms and legs. Its hands and feet each have three claws. It has a thick, long, black tail that it can swing at enemies. Mega Aggron is bulkier and more heavily plated than its previous state. The horns on its forehead are now shorter, and it has a third, wider horn on its nose. Using its horns, it is said to be able to destroy a steel tank. A spike projects downward from both its upper and lower jaw. The protrusions on its shoulders are longer and curve toward its head, and new spikes thrust from holes in its armbands. Its tail is thicker with two bands around it. The gouges in Aggron's armor from previous battles are worn as mementos. The more wounds it has, the more it has battled. It claims a large mountain as its territory and fiercely defends it from trespassers. If its environment is damaged by a flood or a forest fire, it will restore the area by bringing in topsoil and planting trees. It burrows through the strongest of bedrock and digs tunnels, as it searches for iron to eat. Its horns, which it uses to dig through bedrock when seeking food, grow a little longer at a time and can be used to determine its age. Aggron's first major appearance in A Hole Lotta Trouble, under the ownership of Steven Stone. The Iron Armor Pokémon was used to send Team Rocket flying. An Aggron sent a Skarmory to kidnap an Azumarill to sing for him and his children in Pikachu's Summer Festival. Tyson's Sceptile defeated an Aggron belonging to a man named Johnny in Shocks and Bonds. Jessie and James were given a Charizard and Aggron in Grating Spaces. The two Pokémon were used to battle Ash's Donphan and Brock's Steelix. An Aggron is owned by the head engineer in Bibarel Gnaws Best! In Pokémon Ranger and the Kidnapped Riolu! Part Two, Pokémon Hunter J's client used an Aggron to block up passages in a cave to prevent Ash and Kellyn from following him. Another Aggron appeared in Steeling Peace of Mind! and Saving the World From Ruins! where it was one of the Steel-type Pokémon on Iron Island that had gone crazy due to Team Galactic. An Aggron appeared in Trials and Adulations!, where it fought against Dawn's Mamoswine. An Aggron appeared in Familiarity Breeds Strategy! under the ownership of Paul where it was used in the battle against Ash. It fought well against Pikachu with its powerful moves, but could not stand on the same par as his Infernape and was defeated with a Mach Punch. An Aggron that can Mega Evolve appeared in Volcanion and the Mechanical Marvel, under the control of Levi and Cherie's Mega Wave. Aggron also made a cameo in Jirachi: Wish Maker. Brendan was using it in a Double Battle alongside a Shiftry. Multiple Aggron appeared in Lucario and the Mystery of Mew as part of the feuding armies. Also, an Aggron under the ownership of an unnamed Trainer won against another Trainer's Hitmonlee during the town of Rota tournament. Dr. Yung used a mirage Aggron in The Mastermind of Mirage Pokémon. Conway owns an Aggron which made a cameo in Glory Blaze!, battling alongside Dawn's Pachirisu in the Hearthome City Tag Battle Competition. Aggron, together with its evolutionary family Aron and Lairon, appeared in Giratina and the Sky Warrior where it helped his friends to stop the glacier. An Aggron appeared in One Team, Two Team, Red Team, Blue Team! An Aggron appeared in the opening scenes of Zoroark: Master of Illusions. An Aggron appeared in The Journalist from Another Region!. An Aggron that can Mega Evolve into Mega Aggron appeared in Mega Evolution Special I. A Soldier's Aggron appeared during a flashback in The Legend of X, Y, and Z!. AG022 Aggron Ash's Pokédex Aggron, the Iron Armor Pokémon. Aggron is the final evolution of Aron. It shows no mercy to anyone who disturbs its habitat. DP119 Aggron Dawn's Pokédex Aggron, the Iron Armor Pokémon. 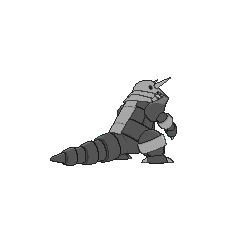 Aggron's steel horns can destroy the firmest of bedrock and it digs tunnels as it looks for iron to eat. DP186 Aggron Dawn's Pokédex Aggron, the Iron Armor Pokémon, and the evolved form of Lairon. 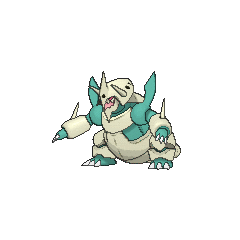 Aggron claims a large mountain for its territory, and fiercely defends it from those who trespass. This concludes the entries from the Diamond and Pearl series. An Aggron appeared during a flashback in The Redemption as one of the many Pokémon fighting in the great war of Kalos, 3000 years previously. 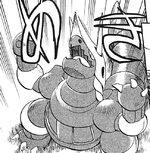 In Pokémon Adventures, Sapphire's Lairon, Rono, evolved into an Aggron after training on Mirage Island. Giovanni is later seen using an Aggron to shatter Deoxys's triangular prism-like barrier with its Brick Breakattack, capturing it. An Aggron appeared in a flashback as a Pokémon trained by the International Police in Innocent Scientist. Pokémon Pinball: Ruby & Sapphire: The EVO Mode banner features an Aggron. Pokémon Mystery Dungeon: Explorers of Sky: Aggron is the boss of Boulder Quarry, which can only be accessed through the Special Episode Here Comes Team Charm!. Aggron claims an entire mountain as its own territory. It mercilessly beats up anything that violates its environment. This Pokémon vigilantly patrols its territory at all times. Aggron is surprisingly protective of its environment. If its mountain is ravaged by a landslide or a fire, this Pokémon will haul topsoil to the area, plant trees, and beautifully restore its own territory. Its iron horns grow longer a little at a time. They are used to determine the Aggron's age. The gouges in its armor are worn with pride as mementos from battles. It claims a large mountain as its sole territory. It mercilessly thrashes those that violate its space. While seeking iron for food, it digs tunnels by breaking through bedrock with its steel horns. You can tell its age by the length of its iron horns. It claims an entire mountain as its territory. It claims an entire mountain as its own. The more wounds it has, the more it has battled, so don't take it lightly. Aggron is protective of its environment. If its mountain is ravaged by a landslide or a fire, this Pokémon will haul topsoil to the area, plant trees, and beautifully restore its own territory. If this Pokémon is given a Ring Target, the effectiveness of Poison-type moves is ½×. If this Pokémon has Filter, the effectiveness of Fighting -, Ground -, and Fire-type moves is 1½×. Moves marked with a superscript game abbreviation can only be bred onto Aggron in that game. 51%-100% HP I don't forgive anyone that messes with my territory! Level up That's right! I leveled up! I'll smash my enemies flat! It opens up fissures in the ground. It also rams to attack. It launches three iron balls to attack. 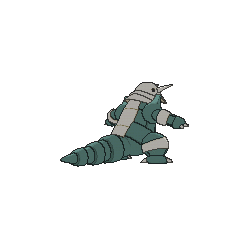 For other sprites and images, please see Aggron images on the Bulbagarden Archives. 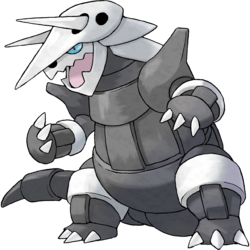 Aggron is the only dual-typed Pokémon to lose a type upon Mega Evolution. Aggron is the heaviest Rock-type Pokémon. Mega Aggron is tied with Shuckle and Mega Steelix for the highest base Defense stat of all Pokémon. Mega Aggron is also tied with Mega Steelix for the highest single base stat of all Mega Evolved Pokémon. Aggron may be based on the Pulgasari, a monster that eats iron in Korean legend. It may also be based on a Triceratops and various theropods. 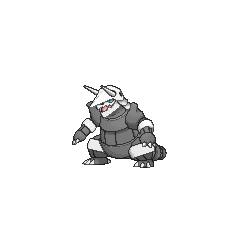 Aggron may be a combination of aggressive, iron, and don. It may also involve aggro (British slang for "aggressive, violent behavior"). Bossgodora may be a combination of boss and dragon, or may be a combination of boss and Kodora (Lairon's Japanese name). Japanese ボスゴドラ Bossgodora From boss, dragon. Can also be taken as "Boss Kodora"